Send money to India by SMS text message ! Now you can quickly and conveniently send money from home or while on the go -- directly from your mobile phone! No more computers required or standing in long queues - RemitGuru's SMS remittance service lets you quickly send money using a few simple SMS commands. Sender Cost: Available at no extra cost ! However, your Mobile Network Operator may charge you for the text messages sent to RemitGuru. Delivery Time: Same as remittance from website . To use RemitGuru's SMS text messaging service, you must first 1) link your mobile phone number to your RemitGuru account, and 2) ensure you have recipient accounts ("nicknames") saved on the system. Log into your REMITGURU account. Click "SMS Remittance" link in the transactions tab in the left menu. Follow instructions on SMS notifications page to link your mobile phone number to your RemitGuru account. This is a one-time process. Ensure you've saved receiver accounts & "nicknames" in RemitGuru before initiating any SMS remittances. Follow the SMS instructions below (SENDGURU). You will receive a text message requesting a confirmation. Only one request can be made at a time. Example: SENDGURU 900 CAD HOME. -Confirm remittance: To proceed with your remittance, reply to the confirmation text message with "YESGURU" within 5 mins of receipt. -Cancel remittance: To cancel a remittance request, simply do not reply after 5 mins your transaction request will automatically get cancelled. 4. Your remittance will be processed & sent! By confirming the remittance request, your remittance will be processed & sent during normal business hours. It's that easy! Processing time is the same as desktop remittance. How to do a SMS remittance? 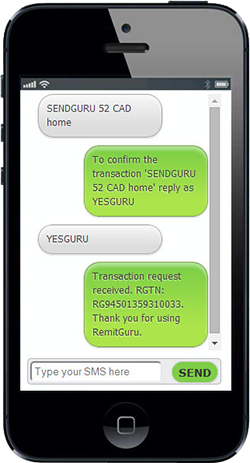 1.SENDGURU is the command used to INITIATE your remittance request. 2. is the AMOUNT you want to send (i.e. 50, 1000, 600 etc.) to your reciever. 3. <CAD \ USD > is the CURRENCY of the transaction. This can be either Canadian Dollar (CAD), US Dollar (USD). Do not spell out the currency, it MUST be 3 digits. 4. <SAVED RECIPIENT'S NICKNAME> is the SAVED NICKNAME of your recipient's destination account that you have saved in RemitGuru. You MUST link your mobile phone number to your RemitGuru account before using this feature. You MUST include a space between each command (as shown in brackets, above).